We are tree surgeons operating in the Stockport area and have a combined experience of over 30 years. The company is run by Andrew Hampson and his team who are highly skilled tree surgeons. Here at Elm House we pride ourselves on not only being properly qualified, but we are also friendly and a pleasure to have around wether it be at your home or in a commercial environment. We are fully qualified and are competitively priced to ensure you get the best possible price. If you contact us today, we promise to get back to you as quickly as possible to get your problem fixed quickly. So if you need a tree surgeon in Stockport quickly, be sure to contact us now. We always have a plan and we always have the right tools with us. We never compromise on quality, but we do get the job done efficiently. We do what is asked of us and leave the site tidy. We look after our planet and recycle all left overs. We won’t cost you the earth and are open to price matching. We always deliver to ensure we have repeat customers. We are professional and approachable which means we turn up with a smile on our faces! “Great service, fantastic reduction job on my beech tree. Lots more light..
Nice bunch of lads, very polite. Highly recommend to all friends and family. We understand that when looking for a tree surgeon, you want someone who is trustworthy and competitively priced. Elm House Tree Services is all of those things. Every job we are invited to do we have to quote for as we need to find out how big a job it is going to be to prune, grind or remove. When we turn up to quote we will look at where troublesome tree or hedge is in relation to nearby buildings and other plants that may need protecting in the process of us doing the job. We will also look at how easy or difficult it will be to get our equipment to the tree or hedge – we will be looking at small alleyways, walls and any other items that may cause problems with us getting our gear in and out. All tree surgeon companies will charge slightly differently however we always quote reasonably and honestly. Below will give you a rough idea of how much it will cost for us to come and do your job – however please remember that each job will need to be quoted individually based on the considerations we mentioned above. Tree Removal – this is normally in the region of £100+VAT and it can increase depending on how big and complicated a job is. Why not check out our blog post “How Much It Costs To Remove A Tree” to see how much we have charged for jobs in the past to give you an idea of what we charge. 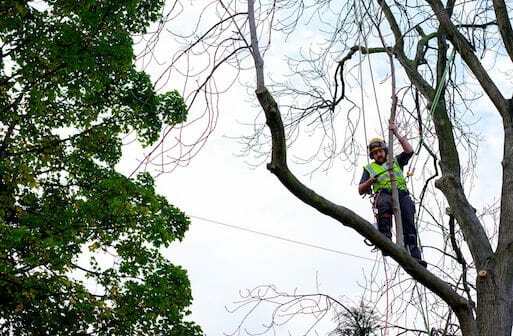 We have worked as tree surgeons in many areas of Stockport and are no stranger to the idea so we will be able to come and quote for your job quickly. Safety is paramount and we are therefore City & Guilds qualified tree surgeons. We have been through all of the courses required to become a tree surgeon who is safe and also knowledgeable. We have studied all species of trees and hedges so that we remove or trim trees in a way that is appropriate. If you want us to do some trimming we will give advice as to when the best time of year to do the pruning is in order to maintain the health of the hedge or tree. We are also experts in removing trees and hedges so that they will not return in future – nobody wants to pay for a job to be done twice. Our tree surgeons will turn up to your house or commercial property on time and are both professional and friendly. We know that our work can be noisy at times but we will do our best to keep the noise to a minimum. We are respectful of the space we are in wether that is your home, or a work place. We look after all of our customers and we always reply phone calls, emails and texts promptly so you know what is happening. We are always happy to answer all questions, before, during and after the job. We hope we are just what you are looking for – why not get in touch with our friendly Stockport tree surgeons now! Looking for a tree surgeon in Manchester? We also serve other areas outside of Stockport!